Here's a little Bugeye trivia... Donald Healey envisioned this car as an inexpensive sports car for the masses. Manufacturing costs needed to be low, so the first design had identical front and rear sheet metal pressings. Healey originally planned for this car to have pop up headlights, but when that proved too costly, the car got the fixed headlights and it's Bugeye (North America) or Frogeye (everywhere else) nickname. The Bugeye really was a sports car for the masses. When new it was just $1800.00. For your money you got a fun sports car and little else. There were no carpets, just rubber mats. There were no windows, just side curtains. No heater or radio. You didn't even get a trunk or outside door handles. You just got an honest to goodness sports car. The Bugeye didn't weigh much and even though its engine was only 998ccs, it could get out of its own way, if you kept the revs up. Handling, by 1950s / early 1960s standards, was spectacular. This car now sits on Minilite wheels, which in my opinion are the best aftermarket wheel for any classic British car. The original hardtop and a new set of side curtains are included. For many, many years the Sprite was in the shadow of the "Big Healeys" and prices were very low. Not anymore. Good Sprites fetch over $10K these days and immaculate ones often sell for twice that much or more. As I write this there are 2 1/2 days left in the auction and this car is up to $9100.00 with 18 bids. Here's one posted on a blog called Woody Boater. Here's one from "Peter Hamilton's Website" With this link, Jeff pointed this out... "Another bit of useless information, most post WWII boats (at least in the US) were RHD. Oddly, these boats are LHD. I never really understood the reasoning for this, as generally most boating reg’s say to keep to the right when two boats are approaching head on. Perhaps it was the opposite in the UK?" 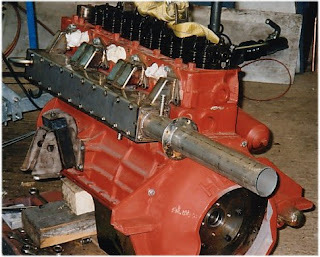 The picture above of an Austin Healey automobile engine set up for marine use comes from the website Healey Boats. The knock-off hubs on the Minilites look amazing. Wow! In looking up some stuff regarding another post, I came across some cool old photos with Bugeyes and Formula Vees.